Then our dance leader started leaving me in charge when she had to be gone for a weekend. She even when to Alaska for a few weeks and turned keys, music files, instruction DVDs, and choice of what to dance each week over to me. I thought I’d spend most of the time panicking, but I didn’t and things went pretty well. I discovered I actually can handle being put in charge of something where I have to work with other people. Fast-forward to now. Since the end of last year, I’ve found myself acting as game master for a table-top RPG group, I’m leading a book club at church, and I’m planning a senior’s recognition event to honor the older members of our congregation. What’s more, I’m actually enjoying myself and I’m not terrible at filling these roles. How on earth did this happen to a shy introvert struggling with social anxiety? Like I said already, being in charge of things is rarely my idea. I have organized church events like the senior’s recognition luncheon before, but even that doesn’t require me to do much “leading.” It’s more of a coordinator role, at least the way I’ve handled it. I think the main thing that I’m learning from these new responsibilities is that I have to find my own way of doing things. 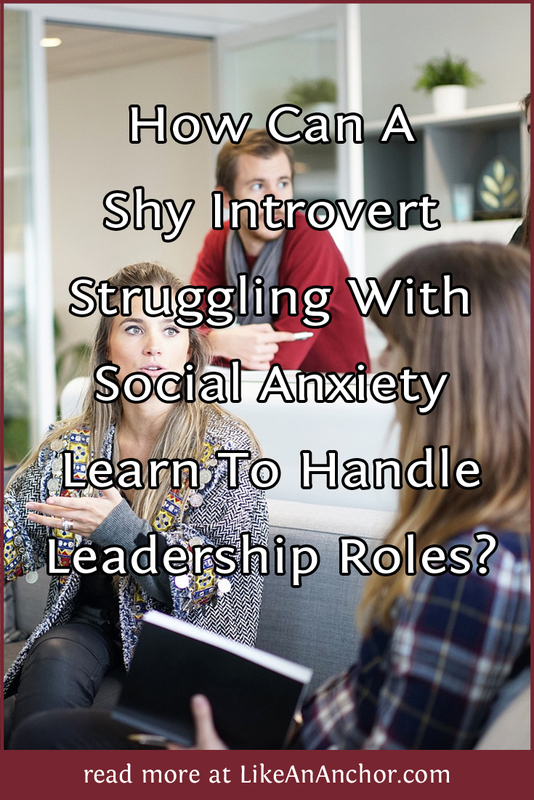 If I try to be a loud, in-your-face, take-charge sort of leader I’m not only going to shock the people who know me but I’m also going to feel inauthentic. And the more I feel like an imposer, the less capable I am of managing my anxiety. One question I asked myself is, “What do I want a confident version of me to look like?” I’m still pondering this, but I’ve come up with a few things so far. Confident-Me is able to share her thoughts and ideas without getting defensive or freaking-out that people will judge me. Confident-Me isn’t threatened by other people disagreeing and holds space for their concerns and suggestions. Confident-Me also takes action to cultivate harmony in the groups I’m leading rather than hiding while things fall apart or get off-track because I’m scared of initiating any sort of conflict. Do I manage to act like Confident-Me all the time? No. But it is starting to get easier to bring that version of my authentic self into these new leadership roles. I’m hoping it will continue to get easier. And I hope if you’re a shy, anxious introvert who ever finds yourself in charge of leading people, you’ll find some encouragement in my story. Have you ever accidentally ended up in a leadership role? How did you handle it? Do you have any tips to share with us? I am happy for you. To be honest I feel like we INFJ are more coordinators, no matter how high we go. I sat as the Programmes Director on the board of the Association of Female Executives of Trinidad and Tobago (an NGO). I was responsible for our monthly programmes. With an ENTJ as the president, our programmes were elaborate with many moving parts. She was happy to throw them all on me because our common Ni/Se vision/implementation wanted the same thing and because I managed myself and coordinated things well. I engaged dormant members by telephone and email to attend. I got excellent feedback on the high quality experience, and how unprecedented the programmes were. I increased attendance from av. of 8 in the previous term to bursting at seams with 35 to 45 in our term. I even hosted (M.C.) one of the meetings. My value system didn’t allow me to stay there very long though. When I finally did the DISC assessment more seriously last year, I scored a high D for dominant or directing. The leadership type of the four letters. But God has already told me He has called me to leadership. Now that I am back doing my masters, I am the leader of a class group. I personally value initiative and efficiency in a leader. Persons have complimented me on being “an excellent leader”. They like that I chart the course (Ni), coordinate us so we finish assignments with time to spare (Ti), create aesthetically pleasing diagrams and powerpoints for our presentations (Se), and make decisions in a democratic and not arbitrary way (Fe) 😄. They feel led. I see the finest INFJ qualities here. I believe when we do lead we have the potential to be the finest leaders. Keep blessing them with your superpowers. Thank you Lleuella 🙂 It’s so encouraging to hear from another INFJ who’s thriving in her leadership roles! Intj here, as you may know. I’m also a pretty good coordinator/organizer. Maybe it’s a J thing? Cheers!